Make your own homemade Easter egg dye! Easter is almost here, and if your kids are anything like mine, they are already getting excited to color Easter eggs! That means that you need to buy an Easter egg decorating kit. WAIT! What if I tell you that you probably already have everything that you need to NATURALY color your Easter eggs for FREE?! It makes pretty eggs, it’s natural, it’s kid safe, and it reduces waste! Thats right! Save those veggie scraps! 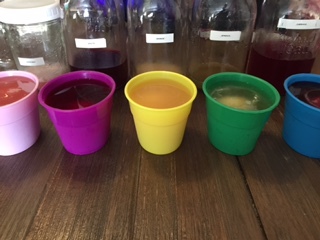 I made beautiful Easter egg dye using scraps! 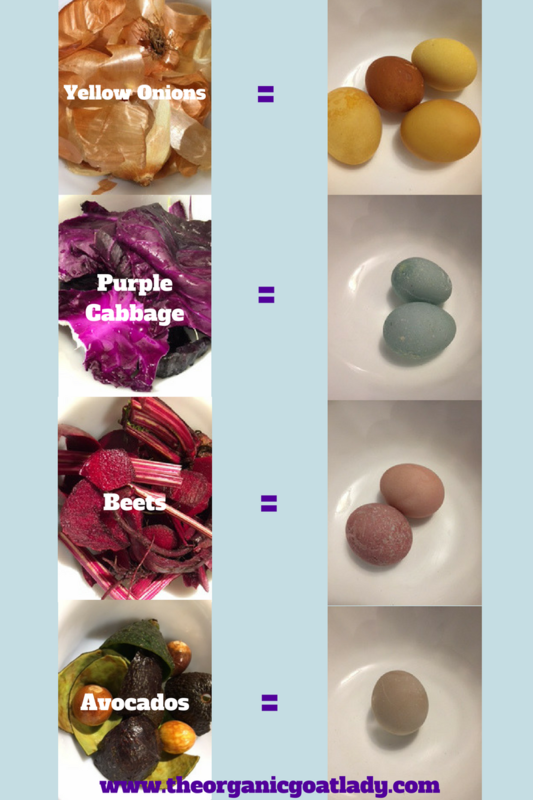 I tried multiple veggies before settling on four that made the beautiful colors on the eggs pictured above. You really don’t need a lot for this project. Here’s the list! Boil your Easter eggs. Boil your eggs in a large pot for about 10-12 minutes. Remove from burner and allow them to cool slightly before dipping them out of the water with a slotted spoon. Let them sit and dry while you complete the following steps! Next you are going to gather your veggie scraps. Make sure that they are rinsed and clean. 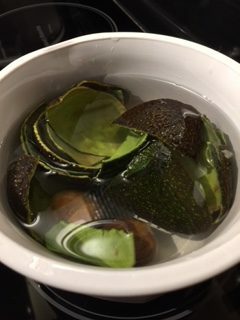 Especially take the time to scrub the avocado peels and seeds so that you don’t end up with avocado chunks in your dye! Add each veggie scrap pile to its own saucepan along with a cup of water and a cup and a half of vinegar. Simmer this mixture covered for about an hour. You will have to continue adding equal parts water and vinegar as the liquid evaporates. After you have simmered your veggie scraps for about an hour you will then need to strain the liquid from the scraps. Make sure that you have enough liquid to cover an egg in whatever container you are using. 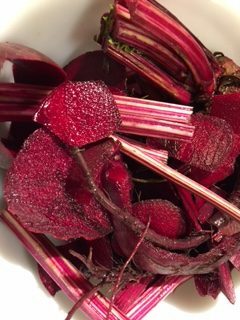 If it’s not enough, add some more vinegar and water to the scraps and simmer a little while longer. 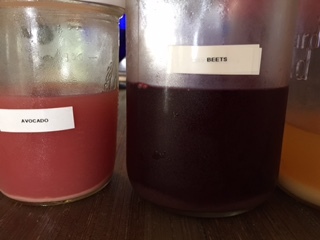 You can either use your dye immediately or store it in glass jars in the fridge for a few days. However, if you refrigerate the dye you will need to heat it before using as the dye works best when warm. Step 4: The Fun Part! Now it’s time to dye the eggs! Gather four small containers to dye your eggs in. 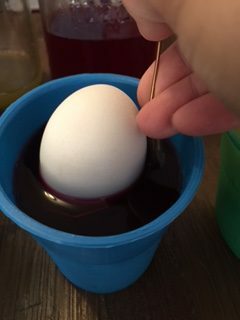 Add your warm dye to your containers and carefully dip an egg into the dye. Repeat by adding eggs to the other colors. Check your eggs, leaving them until they’ve reached the desired shade of color. 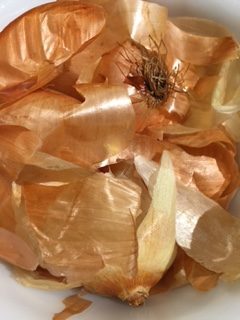 For example, by leaving some eggs in longer than others I was able to make the colors yellow, orange and brown by using just the onion dye. I did experiment with other veggies and fruits, trying to make additional colors. But the following did not dye the eggs as well: Orange peels, carrot peels and spinach leaves. 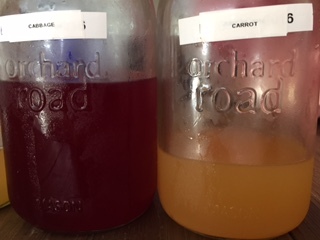 If you experiment with other types of fruits and veggies and have success please comment and let me know! Also, feel free to experiment with different colored eggs! 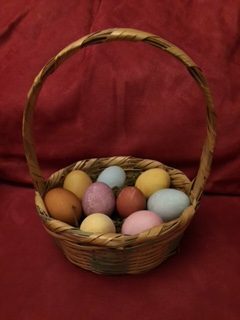 I used only white eggs, but if you are using fresh eggs from your own chickens, see what colors you can make by starting out with brown or blue eggs! Please share pictures of your finished Easter eggs with me! You can either email me, or tag me on Instagram or Facebook! I can’t wait to see your beautiful, natural Easter eggs! Heat the dye before using. Wipe the egg off after dipping it in the vinegar to remove any wax coating on the egg before coloring. Mix colors! Make new colors by dying an egg in one color, lettting it dry, and then dipping it in another color. I hope you enjoy making your natural Easter eggs! Happy Easter! Such a fun way to do it. 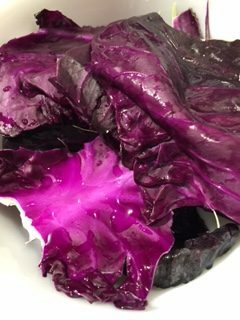 I never even think about how foods give off a natural “dye”. I loved making dyed easter eggs when I was a kid! This is an even better way to make them! This is awesome! Will have to try it out this year with my kids. Thanks! 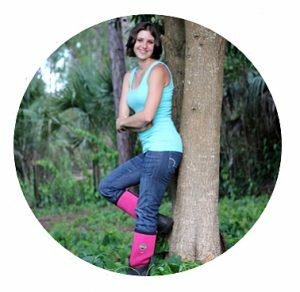 Hi I'm Meghan, a homeschooling mother of 4 living on a homestead in southwest Florida with my family, goats, chickens, guineas and dog:) I strive to live a healthy, self sufficient lifestyle and I love to share that passion with others!